It’s not usually the kind of film I look forward to, but staring ahead at early next year, the most interesting release might be Jonathan Levine’s Warm Bodies. Levine’s 50/50 was a surprise blend of comedy and drama with a peppering of unexpectedly acute observations about terminal disease, relationships, and love. 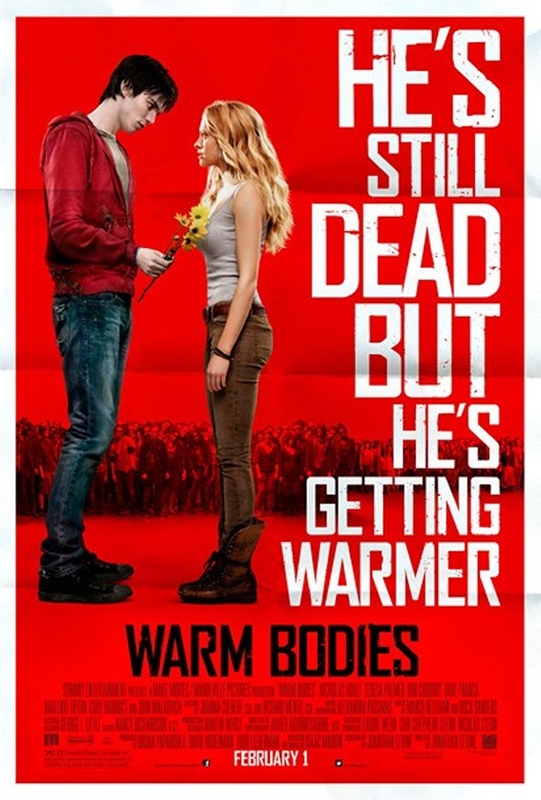 Warm Bodies, at first glance, looks to be in the vein of Shaun of the Dead, though I’m again intrigued by what seems like a thread of sincerity not generally displayed in pictures like these. Some may find it sappy, but I’m a sucker for films that are not afraid to commit to potentially sentimental choices. There’s a self-awareness to this trailer that doesn’t scream “cool,” the way others in this parody realm tend to. Additionally, the visual effects and makeup are top notch. Warm Bodies stars the always interesting Nicholas Hoult (A Single Man, About A Boy) and Teresa Palmer (also starring in Malick’s upcoming Knight of Cups). The film opens on February 1st, 2013. This entry was posted in Films, Movies, Trailers, Uncategorized, Warm Bodies and tagged 2013, 50/50, A Single Man, About A Boy, cinema, film, jonathan levine, Movies, Nicholas Hault, Teresa Palmer, The Wackness, trailers, Warm Bodies. Bookmark the permalink. I haven’t heard of this, but I am interested.